Will this not be a problem in case of Activation/Passivation ? I have tested - no is not a problem. 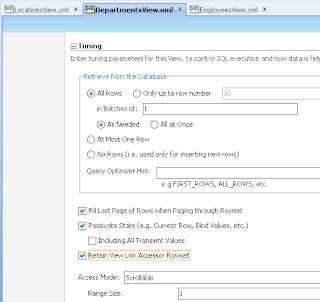 View Link accessor is passivated/activated automatically with the rest of VO data. 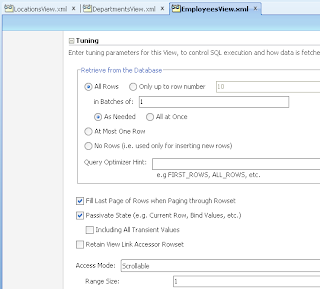 I saw your post about view link accessors and detail VO from AM (http://andrejusb.blogspot.com/2012/05/view-link-accessor-usage-performance.html). I believe your conclusion was that detail VO is faster. 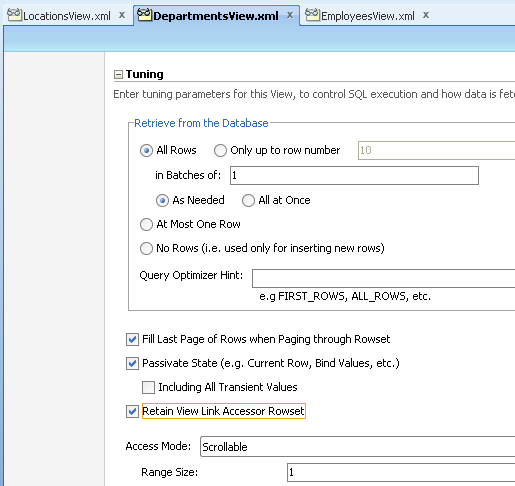 How about using this "Retain View Link Accessor Rowset"? Does it change your opinion? And another question. What happens if I modify the detail VO through the view link accessor, for example add new detail row or change an existing one. 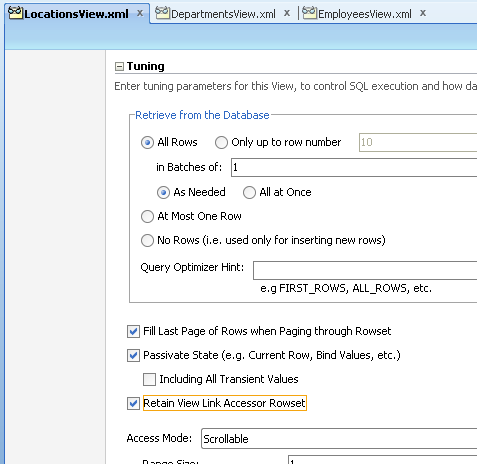 Yes, detail VO is faster - is using data from cache, there is no separate SQL execution. 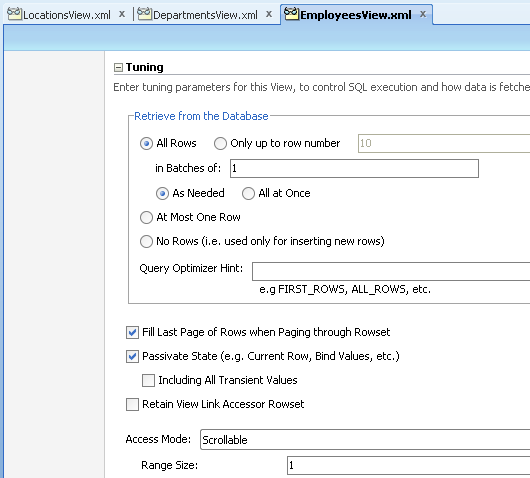 "Retain View Link Accessor Rowset" this option is good for another reason - for ADF trees. 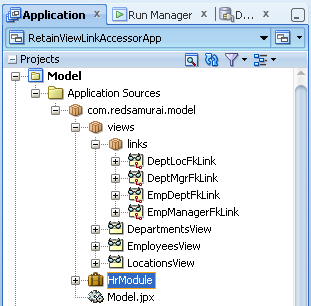 When user opening and collapsing same node - it will keep node children in memory. I will double check your second question about accessor changes and will get back. "What happens if I modify the detail VO through the view link accessor, for example add new detail row or change an existing one" - this will be synchronized with detail VO and displayed on UI. Did you try out the last comment on October 31, 2012 ? 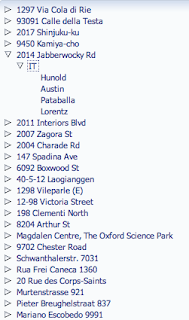 I am also facing a similar issue, where the events (event change listner) is not getting fired, nor any changes to the existing detail rows is not getting reflected in the UI. This comment is from me and im saying it should work. 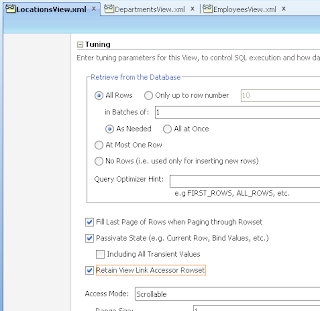 I have a small query here..
Now when i want to select the Retain View Link Accessor Rowset i want to retain only for the first View Link and not for the second one. May i know how this can be achieved. i am in great urgency for this solution. Any immediate solution is appreciated. 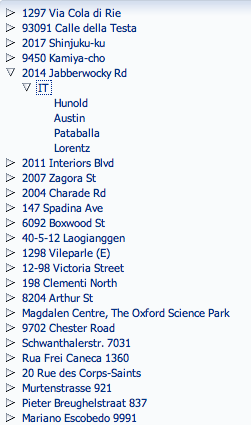 What is the xml for this option? I don't have the checkbox in my JDev 12.1.3... there is another approach?